Do you have old roof tile for sale? We are pleased to offer our "Featured Roof Tiles of the Month" section for those of you who may have large or small quantities of old salvaged roof tile for sale. If it is not something that we have a need for we will be happy to help you sell the roofing material. Using our site to attact roof tile buyers, we offer this service at no charge but we do often negotiate a commission if we are able to match a purchaser with your roof tile. We will determine the potential for the sale of your historic or obsolete roofing tile and post your photos of the tile on our website for selected periods of time. 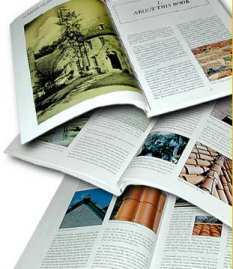 We will need to know the quantity of the field tile, any trim tiles available and the quantity of the same and good, clear photographs of the roof tile. We prefer to have some that show how the reclaimed tile is situated at the time of posting. The rest is easy and we will field all inquiries. We only ask that if you sell your old roof tile before we can that you notify us so that we can offer others the same opportunity that you received. Contact us with any questions. First of all, is it a roof tile that is marketable? There are many tiles which, given the cost of salvaging and the lack of demand, make them undesirable. But even these tiles are occasionally bought by collectors. Secondly, is the tile on or off the roof? We salvage roof tiles from both places. A small tile collection that got out of control. 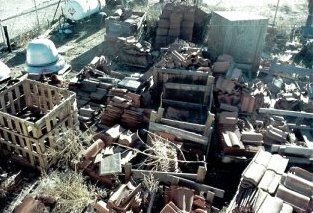 Since there were numerous assorted clay tiles in this group we purchased it all and spent the necessary time to sort, match the roof tile, palletize and inventory them. Salvage percentage on a tile lot like this is usually around 60% and the remaining tile is sent to the landfill! Tiles that are on the ground are often purchased no matter where they are located, depending on the type of roof tile. Salvaged tiles that have been separated and properly palletized will of course bring a higher price. Another important factor is whether the associated trim roof tiles that were on the roof were properly salvaged and available. Having the trim roof tile with the field tiles makes the prospect of purchase much more attractive. If you have a collection of old roof tiles, either small or large, on the ground and in disarray, we are still interested in taking a look. Very often collections of old tile begin to get in the way. They are hard to keep neat, take up space, and often end up getting broken into pieces. We are interested in your tiles and if it is of value to us, we will provide the pallets and labor to sort, palletize and ship out a messy roof tile collection. Again, it will depend on the type of salvaged roof tile we are dealing with. In the long run, whether we purchase it or we pass it on to another for purchase, we hate to see history or historical roof tile tossed out. We will do whatever we can to see that someone, somewhere, can salvage your old roof tiles! 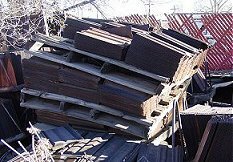 We are interested in your used roof tiles and if it is of value to us, we will provide the pallets and labor to sort, palletize and ship out a messy tile collection. The Roof Tile Guru has been reclaiming historic and obsolete roofing tile for decades. With much of the tile that remains available for salvage, it is imperative that the tiles we obtain are carefully checked, matched, and separated to assure that only quality usable tiles are available for resale or incorporation into restoration projects. Roof tiles that have failed to function, or show obvious signs of product failure, are culled and not taken into inventory. Most often, however, the trim tiles associated with these tiles are salvaged as the process of manufacture is quite different and the trim is inherently stronger.